I have been in Korea exactly 1 month. This seems very strange, in many ways I am very settled, the kids are doing well at school etc… but I still feel like I have just arrived and the ground is still wobbly. There was a steep learning curve when you arrive anywhere and soon that is all forgotten and it becomes commonplace and routine. So before I forget what it is like first moving to Ulsan, here is my guide for getting though the first month. Nam-gu, new downtown, is south of the river and has the Lotte hotel and wheel, shops and is where I live in Skyrex (big tall ugly building – hard to miss). Jung-gu, old downtown, is north of the river, this has more shops and restaurants and Exordium apartments. Dong-gu is the peninsular with the shipyards – Hyundai Heavy Industries, the Hyundai Foreigners Compound, the Hyundai Foreigners School and all other things Hyundai. Food Shopping. This is way easier than I was worried it would be. There are a few big supermarkets, Emart (photos here) and Homeplus are the ones I have been to but I think that Lotte Mart is another one. Then there are small corner shops, like family mart, mini mart – these have a good selection of the basics and often have cash machines. Homeplus is Tescos, so good news for Brits like me as you can get a lot of home products there. There is a good Homeplus in Dong-gu, where you can get large bags of pasta and breakfast cereals, they also have some of the Tesco finest range. My nearest supermarket is Emart, which has pretty much everything. It is a large shop over three floors. The ground floor is all food, the second floor (which you can only get to from the inside escalators) has cleaning products, household stuff, pets supplies and electrical goods, the third floor is clothes and sports stuff. You need a 100won coin for the trolley. There are also plenty of markets, but I haven’t been brave enough to go to them yet. There is also newly opened a Costco, out near the airport. don’t know how to pronounce it I just hand it over and get my bags. Driving. Is more chaotic that I am used to and they beep you a lot. It was stressful at first (I survived and Driving course) but I am getting more used to it. You just have to concentrate more and be that little bit more assertive claiming your road space. We have had to order an English speaking GPS, which will make life a lot easier. Gamza-hab-ne-dar – which is thank you. Schools. There are two options of schools for expats the Hyundai Foreigners School in Dong-gu, or the Busan International Foreign School which is over in Busan (neighbouring city). Recreational stuff. There is a surprising amount of stuff to do in Ulsan. There are a few cinemas and most of the adult films are in the original English with Korean subtitles, children’s films are normally dubbed. Hyundai produces a montly magazine called FLiK, who also have a Facebook page giving useful information about what is going on. There is also a Foreigners club, in the Foreigner compound, which has classes and other activities, like the Ulsan Hash Harriers – a walking/running group that meets alternate Sundays. 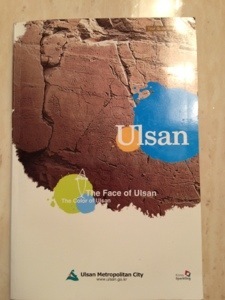 I have found a useful book called Ulsan, The Face of Ulsan, which has places to go and see and importantly has a map in English. There are Twelve Scenic Areas of Ulsan, ranging from the mountains to the beaches to overlooking the shipyards at night! Hotels. There is the, wait for it, Hyundai Hotel in Dong-gu and the Lotte Hotel in Nam-gu. There are lots of motels, but I am not sure they are for sleeping in! I am sure there are more but these are the only 2 that I know so far. That is all I can think of at the moment. I hope that if you are looking at Ulsan and considering moving here this is of some use (say hi and I’ll say hi back) and if you are already here – is there anything I have missed out? My wife and I will most likely be moving out in January. I’ve been here for and week, heading back to the UK on Wednesday and then we are back for our reccy in November. Would be good to pick your brains while we are here in November if that would be possible. One quick question for now; how long did it take for your satnav to arrive? And was there any choice of model or just the one you got? Our satnav took about a month to get to us, but it was delayed in my husband’s office for some of that time. We didn’t have a choice of model and I haven’t seen anyone else with a different one either so I think there might only be one. We got ours though Coens which is a support company for the oil and gas companies. We are away for a bit in November around the 11th but if we are in Ulsan I will happily meet up and help if I can. Okay – thanks. It will be most prob the last week of November. I’ll let you know when it is finalised. Can I be cheaky and ask how much it was? Sorry for the delay I was finding out for you. It was about $400, give or take the exchange rate. We are looking for a day spa for facials pedicures do you have any idea where to go here in Ulsan. I can’t help unfortunately, but check out http://www.ulsanonline.com or search for their Facebook group and you might find the answers on there. Have a look at the Ulsan online Facebook page, there are lots of singles here and a good social life. No problem, I wrote that at the end of my first month, when all the confusing things were still fresh in my mind. After nine months here I can’t even remember what most of them were – you just get used to stuff. Glad it was useful. Hi there.. do you have any prefences for living there? I mean apartment that is cheap for rental,, its okay if one room and there’s an private bathroom? Do you have any contacts in ulsan, dong gu or namgu.. I needed it badly… for 3mos.stay.. Sorry I can’t help with apartments as ours was provided by the company. 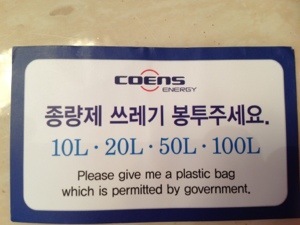 But someone on the Ulsan Online Facebook page might be able to help. Hi! we are looking at the possibility of transferring there in late June-ish. Your tips are great!. Karen Marchant, lovely lady, runs the yoga classes, her website is http://www.ananayoga.com/. There is also a weekly coffee morning, held alternatively near Skyrex and Exordium. If you contact Karen she will tell you where the next one is and give you directions. Also in the building there is a group that meet up to do Mahjong but I don’t know when this is. Most other exercise classes are in the foreigner’s compound – have you found this yet? There is bootcamp three time a week, Zumba, belly dancing and some crafty groups as well. Hello thanks for your blog, my family and I are moving to Ulsan next week! Glad you like my blog. Have fun in Ulsan. Great info here! We are moving to Ulsan in around 8-12 weeks so it’s good to have an insight on what to expect. Thanks for making the effort to share your experience. Thank you, I’m glad you have found my blog useful. Enjoy your move to Ulsan. Hy Esther, I’m Sara and i’m an italian girl, I’ll come in Ulsan in November because my boyfriend have a work in hundai for one year. Really tanks for your blog. Do you know if in Ulsan there’s English courses? Ther’s possibility to finding work? Thanks for your kind comments about my blog. I don’t think it is easy for accompanying partners to get work but not impossible. Fr English lessons there are lots of English teachers in Ulsan and one of them might be able to help you, maybe as a language exchange. The best place to ask is the Ulsan online Facebook group (https://www.facebook.com/groups/38623983631/?ref=ts&fref=ts) and they should be able to help. It is a great group for asking all sorts of Ulsan questions. Is Hyundai foreign school only for kids whos parents working with Hyundai? If not, what is the youngest age? I have 3 1/2 yo son. How is the medical system in Ulsan? I am 16 weeks pregnant and i am nervous about giving birth in different country. Not knowing what to expect. I think that the Hyundai school is open to all foreign children, regardless of if they work for Hyundai or not, but it is best to contact the school directly to check, http://hyundaiforeignschool.com . They do have early years and I’m fairly sure they have classes for 3 year olds. The medical system is very good, I know a few people who have had babies in Korean and some who are pregnant. They are all happy with the care they received. If you are on facebook then the Ulsan Parents Group is a really good place to start. Good luck with your move and your pregnancy. Hi. My wife is due in four days. She’s more than happy to chat to you. What’s your email address? Hi, please tell me is there in Ulsan any PET WHOLESALE manifacture? i just need a website if possible, name etc.. many thanks! Sorry I don’t know the answer to this. I brought my cat supplies from Costco and there are lots of vets around, which stock pet things. We may be moving here in a couple of months. Trying to learn a bit about the area. Do you know what area you will be living in? Do you know what work you’ll be doing when you get here? The only foreigners club is the one in the old compound in Dong-gu. However, there are lots of expats in the downtown areas and plenty to do. There are weekly coffee mornings where you can get to know others and find hobbies that interest you. That I know of there are painting and drawing groups, Majong, yoga, bootcamp, book groups so I sure your wife will find something to do and people to do it with. What company are you with? If they have other families in Ulsan that is a good starting point. Good luck with you move and I hope you enjoy Ulsan. Hi, we are moving out on 1st Dec with my fiance’ work. All of this is very useful, thank you. I was just wondering where you go that book? I’ve checked Amazin and can’t find it, did you get it out there? I found the book from Coens I don’t think you will be able to find a copy outside of Ulsan. We left over a year ago now so I don’t know if it is still available. Good luck with your move, I hope everything goes well. I’m seriously considering moving out to Ulsan from the uk. Is there any jobs out there that a Brit could get? I know that’s a tricky one, but maybe you know of a website or something that could help. hello, we just moved to Ulsan, we are looking for a english kindergarten for our 4years old son, is Hyunday foreigh school a good choice? someone told us that this scholl is better for the primary student, not for kindergarten, do you have any information about this? The school has a good kindergarten but it is best to check it out for yourself, there are quite a few other options as well, we aren’t in Ulsan anymore so I can’t give you more details. Hello, Esther! Thank you for the excellent blog. I was offered a position at the Ulsan National Institute of Science and Technology. I would like to consider this offer. I have a one-year-old baby. I would like to know about the life in Ulsan: health care, kindergarten, the cost of living (apartment, etc.). thank you very much! Thank you for looking at my blog. I have been out of Korea for 2 years now, so can’t give you any information. Ulsan online is a great place to start. It is a very friendly place and I really liked living there.